As you know, advertisers are now targeting android users in order to gain profits. There are several apps like Earnlock, AdPaisa which were paying mobile recharges for unlocking screen (not working now!). Paisa Swipe and Slidejoy are very well known apps in this category and they have been successful due to well planned strategy. Recently we have discovered new app known as AdMe which rewards users with PayPal money. That means, you have to have a verified Paypal account to receive earned cash directly into bank. Since this app is exclusively for USA users, you have to download it using VPN. Here is the link to download it from Google play. Just unlock the cell normally as you do and money will be added to account for watching image ad. 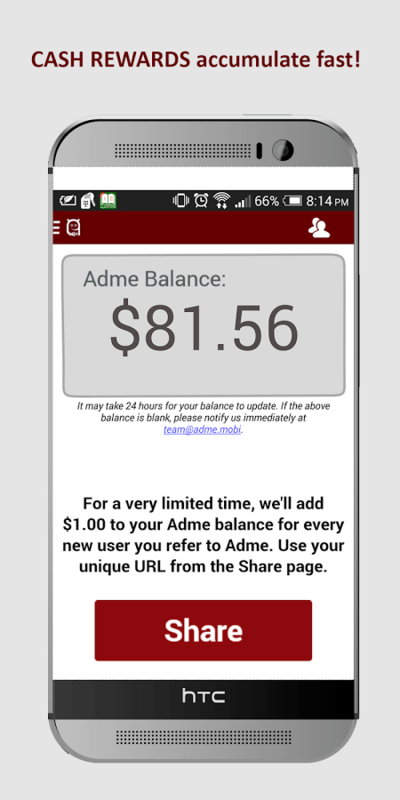 Since AdMe is new to market, it is offering 1$ (approximately 62 Rs) for each successful referral. So, start earning money now and redeem it in the form of PayPal money. Amount will be transferred to your bank account within 4-5 days. I wanted to ask you which card[(debit/credit) and bank name please] did you use for verifying the paypal account in India. Paypal rejects sbi cards I have tried many times but could never verify paypal account. I used Indian Overseas Bank for PayPal account. Try accessing different server locations from vpn. Choose country other than India. as we all knwo some apps are there which says refer by sharing unique code but many of us dont use the code. is there any way to merge the link with code?? Is it work on tablets? sir u got money from this app..directly to u r paypal account..because it is an american app ???? Yes we can get paypal money even though if it’s American app. What is apkleecher? Its really give money? You can download direct apk file of any app on google play. But how sharing will work. As the app says it shares a unique referral link. But we can download it directly from play store so, by the ways u say, We can’t download the app with The unique referral link. Just ask your friends to download it via VPN (it works). You will surely earn 1$ per referral. Not Sure..Give it a try. 1) Goto apkleecher and paste google play link of the app there. You can get direct apk file from it. 2)Or download Hotspot shield vpn from play store and enable it. Now just open android market and you will get the app. There’s no risk of virus. I have scanned downloaded files using avg. Option 1 will 100% work because I have used it. This app is working in India????? Yes. But you need to have PayPal account to receive money.